Ian and Jonty first met at drama school in Birmingham in 1983 where they became firm friends. Even back then people would ask ‘are you a double act?’ to which the boys would answer, in unison, ‘No’. Little did they know where this shared sense of humour and bond of friendship would take them. Jonty is a brilliant mimic and Eric Morecambe was one of many impressions he would perform from an early age. Eric was his hero and remains so to this day. Jonty is a self confessed Morecambe and Wise anorak and it was his knowledge and love of the boys that proved to be the bedrock of their story. In 2002 both Ian and Jonty were now jobbing actors and members of The Stage Golfing Society and every year the stage would put on a review/show for its host club, Richmond Golf Club. This particular year the theme was comedy through the ages. Jonty was asked to ‘do’ Eric. All that was needed was an Ern. Looking across the bar he spied his little friend Ian who when asked to ‘do’ Ern replied ‘Oh alright, but I look nothing like him, I’m more of a Robert Redford than an Ern’. They performed a five minute sketch that went very well, but it wasn’t until they were asked to revive the piece some years later in 2013 that things really changed. This time they added some of their own material and it was after the show at a golf dinner at John O’Gaunt Golf Club that the boys listened to the chorus of ‘you must do something with this’. It has to be said by now nature had taken its course with Jonty’s hair and Ian had fully developed the short fat hairy legs! At the function that night, amongst others, was Mick Flinn of The New Seekers. He asked the boys to perform at his over 40’s night at a club in Rickmansworth where he said he would introduce someone who may be able to help them. His name was Martin Clarkson and he also was a huge Morecambe and Wise fan and someone who was to prove hugely important in the future of Ian and Jonty’s ambitions to put on a play based on the lives of their heroes. Martin backed the boys to put on a small tester show of 35 minutes at the 503 Theatre in London. To an invited audience, the boys tried out their own material and the basis of the play Eric and Little Ern along with some original Morecambe & Wise material. The response was overwhelming. Now the work began in earnest. Martin introduced the boys to a theatre producer, James Seabright who also saw the potential and backed the show to go to the Edinburgh Fringe in 2013. The play was directed by Owen Lewis and after a few preview’s in London, the play opened at The Edinburgh Fringe, to rave reviews and a sell out run. During the run, a certain Gary Morecambe saw the show and loved it. He met the boys afterwards and is now a firm friend as is Gail his sister and Eric’s wife Joan. Support and approval from the family were massively important to Ian and Jonty and continues to be so. The show then went on a hugely successful tour, which culminated in its first West End run in the Christmas of 2013 at the Vaudeville Theatre, again to rave reviews and standing ovations. 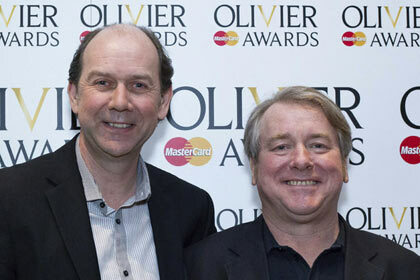 “Eric and Little Ern” written and performed by Ian Ashpitel and Jonty Stephens was nominated for an Olivier Award in 2014. Another tour and a Christmas run at the St James Theatre London followed. Along the way the boys appeared on several TV and radio shows and have recently appeared on The One Show with two other comedy icons Des O’Connor and Jimmy Tarbuck. After putting Eric and Little Ern to bed for a while, the boys are currently developing a concert style show 'Eric and Ern' and performing on the P & O’s flag ship Britannia as well as several shows for Warner Holidays. The whole adventure has been the stuff of dreams. Ian and Jonty continue to shine a light on the talents of Britain’s best loved comedy duo to audiences who knew and loved them and also to those who may not have known just how brilliant they were. Eric Morecambe (John Eric Bartholomew, 14 May 1926 – 28 May 1984) and Ernie Wise (Ernest Wiseman, 27 November 1925 – 21 March 1999), known as Morecambe and Wise (also Eric and Ernie), were a British comic double act, working in variety, radio, film and most successfully in television. Their partnership lasted from 1941 until Morecambe's death in 1984. They have been described as "the most illustrious, and the best-loved, double-act that Britain has ever produced". 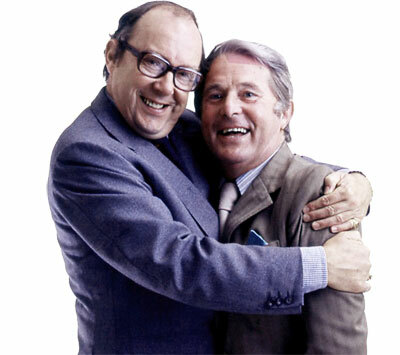 In a list of the 100 Greatest British Television Programmes drawn up by the British Film Institute in 2000, voted for by industry professionals, The Morecambe and Wise Show was placed 14th. In September 2006, they were voted by the general public as number 2 in a poll of TV's 50 Greatest Stars and in 2011 their early career was the subject of the television biopic Eric and Ernie. In 2013, the two were honoured with a blue plaque at Teddington studios where their last four series were recorded.